The weather forecast for Saturday in the Adirondack High Peaks was questionable with scattered rain, but we were ready to get into the woods. Our choice was TableTop Mountain in Keene, NY. Leesa and I had not climbed it before. We parked our car on the Adirondack Loj Road at the intersection with the South Meadow Road. In the summer months, you can drive the South Meadow Road to the Marcy Dam Truck Trail and save yourself an extra mile or so of walking. There was a fresh inch on snow on the ground, but it was expected to get into the mid 40's F.
The trip to Marcy Dam relatively flat and quick. The foot bridge at the dam was washed out on 8/28/11 in Hurricane Irene and has not been rebuilt. We left the dam and climbed the Van Hoevenburg trail towards Mount Marcy and past the Phelps trail. You eventually see the sign (pictured below) which denotes the start of the herd path to Table Top. Although it is a herd path, it is quite easy to follow. The entire hike is actually relatively easy, with no extremely difficult sections. As we started to get near the summit plateau, it began to look like winter. There was a little snow and rime ice in the trees. We wore micro spikes for traction. No snowshoes or crampons were necessary. We enjoyed the hike. There are limited views from Table Top, but as you can see in the above pictures it's still nice. I felt like this was one of the easier high peaks to climb since there were no sections of the trail that posed any great difficulty. Nice post! More wintery looking than I would have expected. How much snow was on the ground above Indian Falls, just the inch or two that had recently fallen or is there still a base? 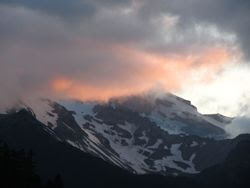 The clouds add some nice drama to the views of the snow covered peaks in your photos. There was a small base, but not too much . The trail is higher than the adjacent area because it had been packed down and didn't melt as fast. Thanks. Enjoy your hike! The trail has had a slight re-route this I was there last. Be prepared for snow and ice. Nice post - is there an advantage to starting where you did as opposed to the Loj? You don't have to pay to park at South Meadow, otherwise no advantage. 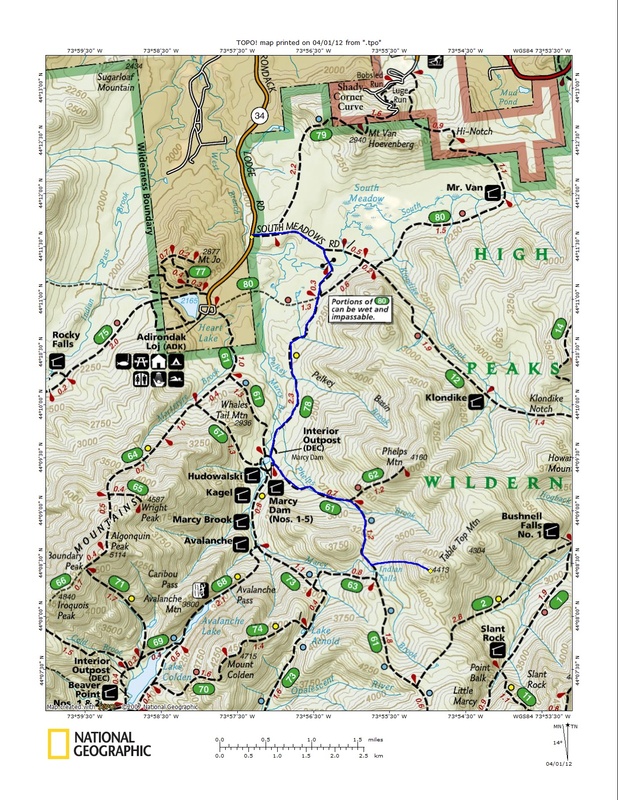 About to hike Phelps/Tabletop this weekend- can you still park on the Marcy Dam Truck Trail via South Meadow Road?? You can park on South Meadow Road, but not on the truck trail.